Charles Gregg-Geist is a writer for the Michigan Daily, the leading news source for the University of Michigan. This article was brought to CNN.com by UWIRE, the leading provider of student-generated content. UWIRE aims to identify and promote the brightest young content creators and deliver their work to a larger audience via professional media partners such as CNN.com. Visit UWIRE.com to learn more. 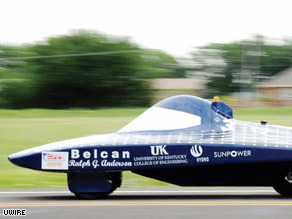 The University of Kentucky's solar car races along the road, on its way to the finish line. (UWIRE) -- In the world of higher education, summer is usually the off-season. But for some students, this summer was the culmination of years of hard work in a 2,400-mile solar car race from Plano, Texas to Calgary, Alberta. Fifteen teams of students drove photovoltaic-powered cars across the North American Solar Challenge finish line in Calgary Tuesday, led by the University of Michigan Solar Car Team and its vehicle, Continuum. Placing second was the car Ra 7 from Principia College, followed by the sole European finisher, the German FH Bochum Solar Car Team. Michigan's victory, which took about 51 hours and 42 minutes on the road, is its fifth NASC championship. The school also won the last NASC, in 2005. It took Principia almost ten hours more than Michigan to complete the race, in about 61 hours and 38 minutes. Bochum's car took about two hours more, but the University of Waterloo Midnight Sun Solar Car Team was a very close fourth, taking about fifteen minutes longer. Principia's success may be as noteworthy as Michigan's margin of victory. The college has fewer than 550 students, all of them undergraduates. It's a sharp contrast from the enormous research universities that traditionally win solar car races. "It's unique, I think, for their college to field a team, (because) they don't have an engineering school," said Dan Eberle, NASC's organizer. But he noted that small teams have had some success in the past. "If you can get a group of folks who are really committed, then you can do a lot," he said. UWIRE: Can other energy sources temper gas costs? Jeff Ferman, the race manager for Michigan, talked about how rewarding it was to enter Calgary and be greeted by 40,000 people. "All the time and dedication really paid off," he said. "We got to get out and walk across the finish line with (the car). It was great." "The streets were lined with people," he said. "There were people on overpasses with tripods taking pictures." The Michigan team led almost the entire race from Texas, trailing only on the first day of driving when it had to stop to fix a minor electrical problem. But that 20-minute stop was the only time it had to pull over to make repairs, which team members said was one reason they did so well. "Reliability is one of the key things," said Steve Hechtman, Michigan's project manager and a driver. "As they get more miles, teams start to get more problems with the car." "Once we left Fargo we just started pulling away from the other teams," he said, referring to the stop the cars made in Fargo, North Dakota Saturday. Eberle said building a reliable car is "the first criteria" for a successful solar car team. "There's two things that really make a team," he said, discussing Continuum's crew. "One is they're very well-organized. Two is that they've been able to stay on the road." Eberle said he was still surprised how far ahead of the rest of the field Michigan was. He noted that Michigan uses gallium arsenide multi-junction photovoltaic cells on their car. The gallium cells can provide almost 50 percent more power than silicon photovoltaic cells, but are nearly twice as expensive. Principia and a number of other teams also use the gallium cells. "We do limit the surface area of the gallium cells," Eberle said, but added, "the people who came in first are the people with the high-performance cells." Luke Martz, director of fundraising for Iowa State University's PrISUm Solar Car Team, said he thought the difference between the types of cells teams used had a major impact on the race. PrISUm, which placed eighth, uses silicon cells. "There's not anything that I hold against any other teams that did use gallium cells," he said. "But it's like apples and oranges." Darshni Pillay, operations manager for the University of Calgary Solar Car Team, disagreed about the advantage provided by the gallium cells. Her team, which uses the more expensive cells, came in sixth, two spots ahead of PrISUm. "I really don't think that would have been a deciding factor," she said. She said the regulation limiting the surface area of the cells negated most of the advantage they provided. Pillay pointed out that Calgary's team, like PrISUm, had to tow its car when cloud cover was heavy in the early stages of the race. She said the reason leading teams didn't have to "trailer" -- which is legal but incurs a time penalty -- was because they were able to get ahead of the weather, not because of any superior technology. Martz and Pillay both said they were happy with their results. Pillay pointed out that this year was only the second NASC her team has competed in, and said sixth is a big step up from their last finish. In 2005 Calgary's team placed 13th. PrISUm's finish in the middle of the pack is noteworthy because the team barely managed to qualify for the race. Its car didn't, in fact, finish the 60 laps on a closed race track in Plano, Texas necessary to qualify for the race. Martz said the car had mechanical problems when it first arrived in Texas and so the team only got it on the track on the second day of a two-day qualifying process. PrISUm only was allowed to compete after finishing the first leg of the trip, to Neosho, Missouri, in the allotted time without trailering. The teams from Durham University and Oregon State University, which also didn't qualify on the closed track, didn't make it to Neosho in time. "I think we did exceptionally well with what we had," Martz said. He noted that when the car had problems, the other teams were eager to help. "If there's a team that's struggling," he said, "they're going to get help from whoever's available." Pillay added one caveat. "Everyone's sympathetic to each other and wants to see all the other teams cross the finish line," she said. "Maybe just not in front of them."